I am on a Mac using the latest version of Lightroom CC Classic. I used to have no problems merging many photos to a panorama, but now frequently when I try to merge more than 4 photos I get a message like “4 out of 9 photos could not be merged”. I used to shoot 20 megapixels, now shoot 30. Is it just more info than LR can handle? I shoot on a tripod, loosen the ball head swivel knob, and just rotate the ballhead. I don’t use any fancy panorama equipment. I just eyeball it and go for it. I’ve reset LR preferences, to no avail. Any thoughts? Best guess is the images are not lining up or you don’t have enough overlap. I’ve stitched far more than 4 from a 5D Mark IV (30mp sensor) without issue. To sort out the software issue, I suggest taking a set of images that did merge in the past and see if you now run into the same problem with them. Did you try using a different projection ? 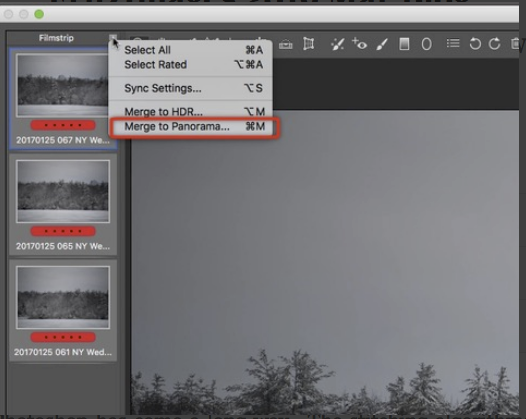 Have you given a try with creating your pano in ACR? I heard via an Adobe evangelist that it uses a different algorithm than LR and CC19. I have had very good success with it over the other Adobe software… very very simple process, but not really well known or documented. Goto into ACR filmstrip on the left top, select all then Merge into pano. I also open the save as box and configure to save as .tiff. I like both Keith and Bills suggestions to troubleshot. I recently had a really difficult UL-UW pano to stitch. I took each column into ACR did a stitch and saved as tif… Then I opened up the three columns and did the final stitch.